Taking a break from Shakespeare, director Kenneth Branagh manages a neat trick: He serves up a visually witty and passably entertaining version of a story so familiar, we hardly can believe anyone wants to tell it again. Lily James (of Downton Abbey) appears as Cinderella, a preternaturally understanding young woman who does her best to adjust to the substantial misfortunes fate deals her: the early-picture death of her mother (Hayley Atwell) and the later demise of her doting father (Ben Chaplin). It seems Dad made only one major mistake in his life: After being widowed, he married the conniving Lady Tremaine (Cate Blanchett) and brought his new wife and two daughters (Sophie McShera and Holliday Grainger) into his stately home. You don’t need to know much more because you already get the drift. 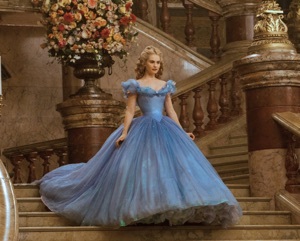 The pleasures of this Disney-produced edition of Cinderella have less to do with discovery than with its visual extravagance, created in part by cinematographer Haris Zambarloukos. Branagh’s use of computer generated imagery serves to suggest a connection with Disney’s fanciful animated version, a 1950 release that’s regarded as a classic. Technological advances allow Branagh to offer novel views of wonders such as lizards turning into footmen for a pumpkin that has been transformed into a carriage. Did I mention the movie’s lovable mice? An able supporting cast helps bring Chris Weitz’s screenplay to life, as well. Richard Madden plays the prince in this version, never a great role. The prince’s father (Derek Jacoby) presses his son to get married, but pushes for the young man to wed a royal. We also meet a devious Grand Duke portrayed by Stellan Skarsgard, who’s ultimately saddled with the task of bringing additional intrigue to the story. In this telling, Lady Tremaine — a.k.a. The Wicked Stepmother — tries to cook up a conspiracy with the Grand Duke that will prevent Cinderella from fulfilling her romantic destiny. I suppose we shouldn’t be surprised that the gifted Blanchett makes the role her own, avoiding the temptation to create a sneering caricature. The fairy godmother is played by Helena Bonham Carter, an actress who attempts to wring every bit of amusement out of her role. This Cinderella isn’t delivered with a heavy hand, and the result is an entertainment that boasts a wide range of secondary pleasures. Examples: Dante Ferretti’s sets are suitably impressive. Sandy Powell’s costumes provide their own amusement, particular those of Drisella and Anastasia, the two impossibly snooty stepsisters. Evil Stepmom boasts a preposterously expressive collection of hats. Given the scale and color of the production, it’s hardly surprising that Cinderella functions like a musical in almost every respect, except for the fact that it has no musical numbers. I can’t say I missed them. The primary audience — girls and tweens — probably will enjoy the movie, and the parents who accompany them won’t suffer. To ask for anything more from another telling of the Cinderella story might be to demand the impossible.